A graphic I created summarizing key cultural and biological milestones. Note that time is situated on a logarithmic scale. Full resolution image here. Of course, the hominid line began diverging genetically from that of other primates around 7 million year ago. Image from Berkeley’s Understanding Evolution. Full resolution image here. Finally, here is the geography & timeline of the emigration waves out of Africa, courtesy of Huffington Post and National Geographic. Emigration paths were radically influenced by the Quaternary glaciation. Emigration was largely caused by the Toba supereruption. This post bears on the history of human- and hominid-like species. 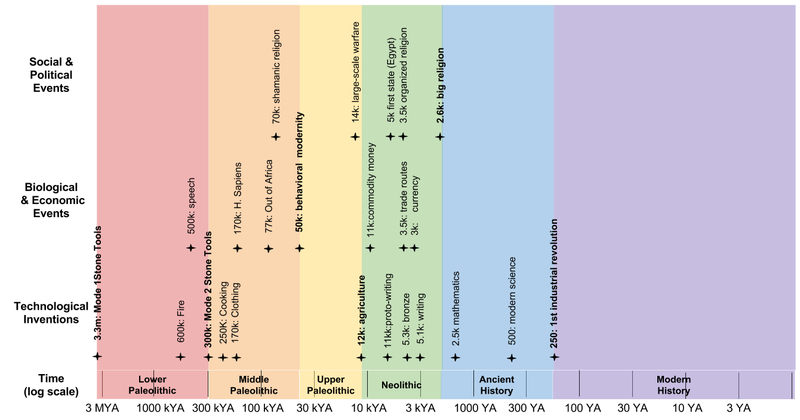 For a history of the Earth, see my common descent graphic here. For a history of the universe, see Deep Time: The Story of Cosmogenesis.